There are literally thousands of web sites on vampires, but practically none of them are dedicated to the themes that are of particular interest to me. My primary aim is to understand what happened in the 17th and 18th century cases of vampirism, how people viewed and debated these occurrences, and how they are related to the general evolution of ideas, society, and religion. I want to get the historical facts right, and I want to understand the thoughts and backgrounds of the people who investigated and wrote about vampires. In creating this blog it is my hope that I will get in touch with other people around the world who like me are intrigued by the facts and thoughts of those early modern Europeans who tried to investigate and understand vampires cases, in particular those that occurred on the periphery of the Habsburg empire during the 18the Century. To stress that this is the primary subject for this blog, I have decided to name it Magia Posthuma: posthumous magic, which was the term used by some writers of that day to describe the phenomena of uncorrupted corpses harassing the living and the means used to stop the activities of these corpses. I intend to now and then post information, reviews, questions and bits of source material. I hope to get feedback from people with a similar interest. 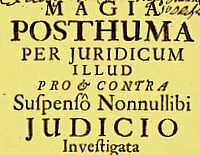 In particular I hope to get in touch with people who will share information and thoughts on Magia Posthuma, and if the blog proves to be a successful site for sharing ideas and information, I may also put some longer essays on the blog. Hello. I just stumbled apon your bolg and had to introduce myself. I'm Jennie and I'm looking for some facts on vampire anthropology, if you will. It's for a book I'm writting. The book itself is fiction, but I'm trying my best to base it on facts. I would like to know if there are any books or information written between 1600's-1800's that explanes the organs of vampires sientificaly? I'm not so concerined with "why" but reather, the "how". Is there anything outside of the church, sinning, being buried the wrong way, etc. that would lead one to believe one is or might become a vampire? Thank you for your time. I think you will have to be more explicit about your questions, because I am not quite sure what you are looking for. A lot of the 18th century debate concerned the incorruptibility or flexibility of the corpses examined, but I am not sure if this is what you mean by explaining the organs of vampires scientifically? There are a number of reasons why people might suspect someone of being or becoming a vampire. Frequently, the vampire was some kind of 'outsider' while alive, but accidents or incorect behaviour or influence could also make a deceased person suspect. By the way, you should remember that there was no such thing as "the church" at this time, and the views on revenants differed between the various Christian churches, and that even within these there were different opinions.